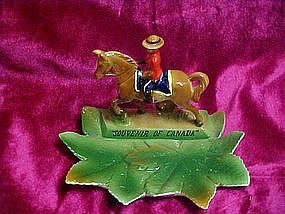 THis is a wonderful Souvenir of Canada, Made by Napco giftware of fine hand decorated glazed ceramic. Bottom ash tray section is the Canadian Maple leaves. and on the back is a figural of a Royal Canadian Mounted Police on horseback. This is very delecate but still in perfect condition.